“I do not want to make a painting; I want to open up space, create a new dimension for art, tie in with the cosmos, as it endlessly expands beyond the confining plane of the picture. With my innovation of the hole pierced through the canvas in repetitive formations, I have not attempted to decorate a surface, but on the contrary, I have tried to break its dimensional limitations" (Lucio Fontana, quoted in Lucio Fontana, exh. cat., Walker Art Center, Minneapolis, 1966). Striking in both color and form, Concetto spaziale, Attese reflects Lucio Fontana’s fascination with space travel and his radical post-modernist vision of art. In the 1946 Manifesto Blanco (White Manifesto), overseen by Fontana, he laid the groundwork for the technical and spatial experiments that occupied him for the rest of his life. Fontana sought to develop a new artistic language that could convey an infinite dimension, breaking from the traditional view of art by combining sculpture, painting and architecture. Begun in 1958, Fontana’s tagli, like the present example, display his mastery of these complex theories and his evolved technical perfection: Fontana incised the painted canvas and then gently opened the cut with his hands, exposing a dimensional space that exists below the flat surface, thus transforming the work into a sculptural object. The gestural slashes, a momentous, seemingly violent act, disrupts the purity of the monochromatic surface. Beyond the physical implications of the work, the inclusion of “attese” in the title, which translates to “expectations”, suggests a contemplative interpretation of the object as existing both in space and in time, furthering Fontana’s desire to represent the infinite. In 1966, Fontana exhibited his Concetto Spaziale series in the Italian Pavillion at the XXXIII Venice Biennale and won the International Grand Price for Painting, just two years before his death. There, white canvases with these iconic cuts were hung in a white room designed by architect Carlo Scarpa, creating an immersive “spatial environment”. 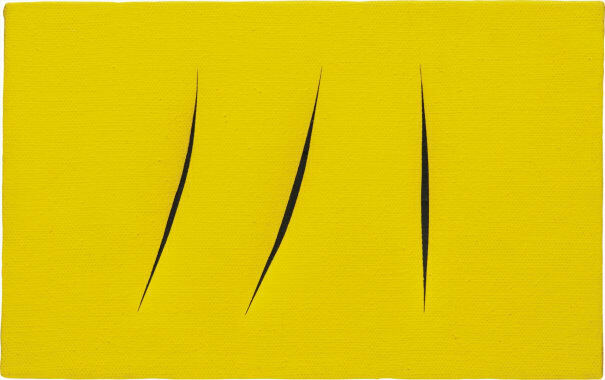 Executed in 1962, Concetto spaziale, Attese is a prime example of Lucio Fontana’s tagli paintings, rendered in color rather than white, arguably his most iconic and revered group of work. With its radiant yellow hue, the present lot stands out with its black depths, which stand in stark contrast to the colored ground, challenging the viewer to see through the canvas into the infinity of space.